Apart from restaurant and hotel services, we take pride in ensuring that our guests enjoy their stay with us. For instance, the services of our ski shop are developed continuously on the basis of our own ideas and on the feedback that our customers give us. Our ski garage takes care of your skis even for longer periods if necessary, and our Aurora Borealis observation screen gives you real-time information and forecasts on the activity of the Northern Lights. We do our best to help you in everything. We will make all the necessary arrangements for you, whether it is a safari, guided tour, skiing school or a private party. A holiday should be a success in every respect! We are here for you. Please don't hesitate to contact us with any questions you might have. 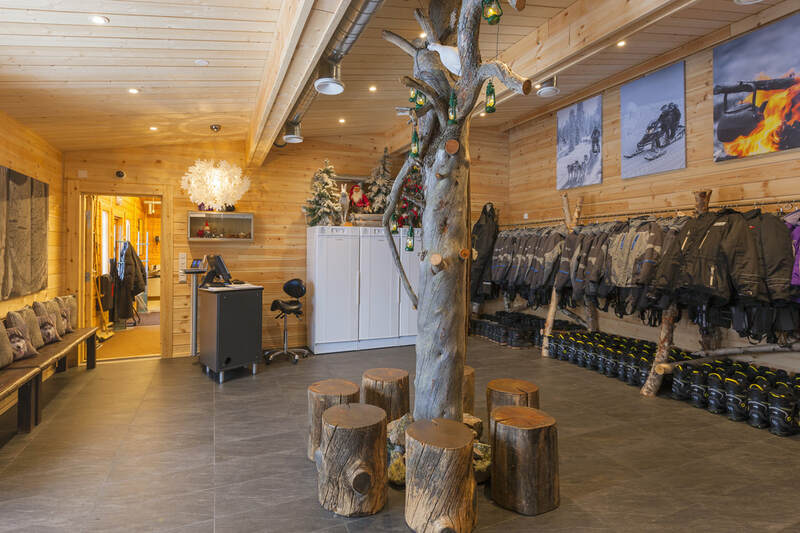 The rental service at Ylläshumina’s ski shop offers you professional advice for choosing the right rental skis, boots, poles or an all-inclusive set for conquering the trails and fells. The shop also hires out other equipment, such as snowshoes, for example. All our bindings are SNS-standard. ​In addition, the ski shop sells ski wax, gloves, hats, socks and other necessities for Lappish winter expeditions. 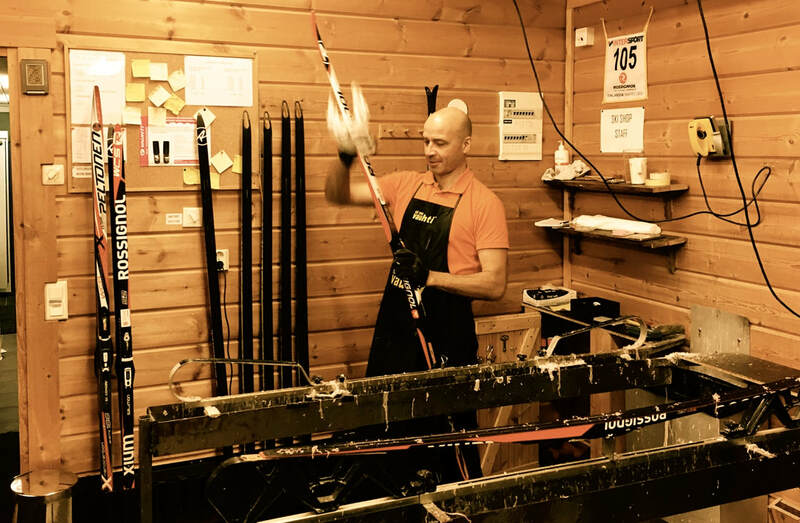 The professionals at the ski shop wax your cross-country skis ready for the trails, whatever the weather, and restore your skis to top form for a new season after their summer break. Ylläshumina also provides facilities for self-service ski care. Ylläshumina provides facilities for self-service ski care right beside the main reception building. This is where you can wax your skis to accommodate the changing weather conditions or leave the job to a knowledgeable professional. 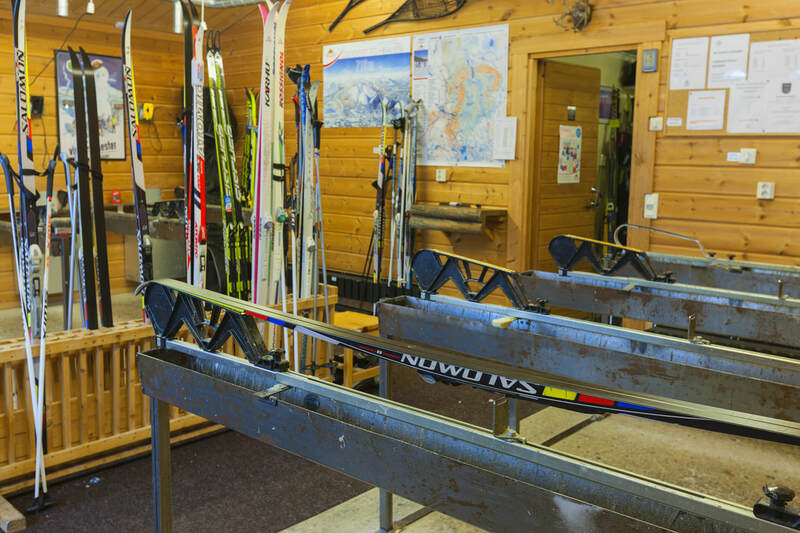 At Ylläshumina’s ski garage your skis stay safe – short-term and long-term. 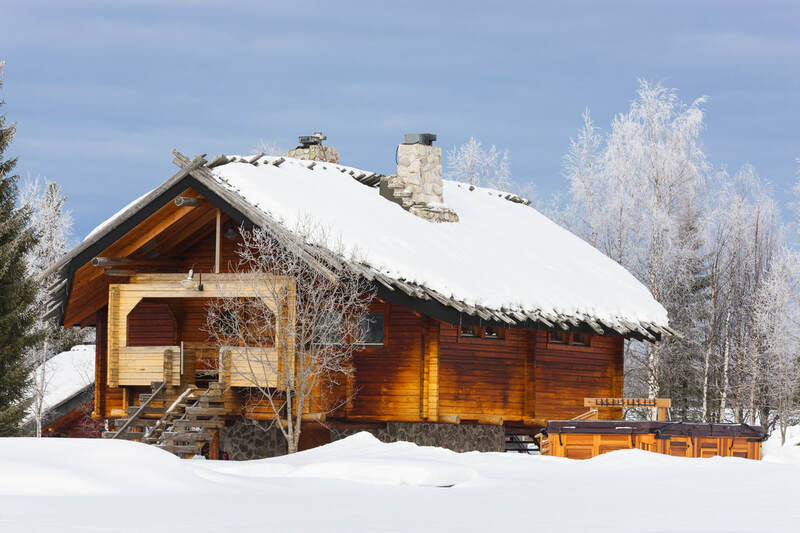 If you know that you’ll be coming back for another skiing holiday in a month’s time, for example, and that you won’t need your skis in the meantime, leave them at Ylläshumina Hotel! Our ski garage is extremely handy and truly unique. Ylläshumina’s traditional Lappish sauna, which is located in the immediate vicinity of the main reception building, is the perfect place to relax and cleanse mind and body. One end of the sauna is reserved for women and the other for men. The saunas are also ideal for larger groups to enjoy invigorating steam followed by a cosy chat around the fire. Bathrobes can be hired for the sauna. Ask us for more information! Sauna-goers also have access to Arctic Spa. You will find our new Arctic Spa next to the main sauna building. This large jacuzzi is open for guests to use twice a week. Enjoy the warm water and the massaging jets or swim against the stream. The Arctic spa is available on request at other times. 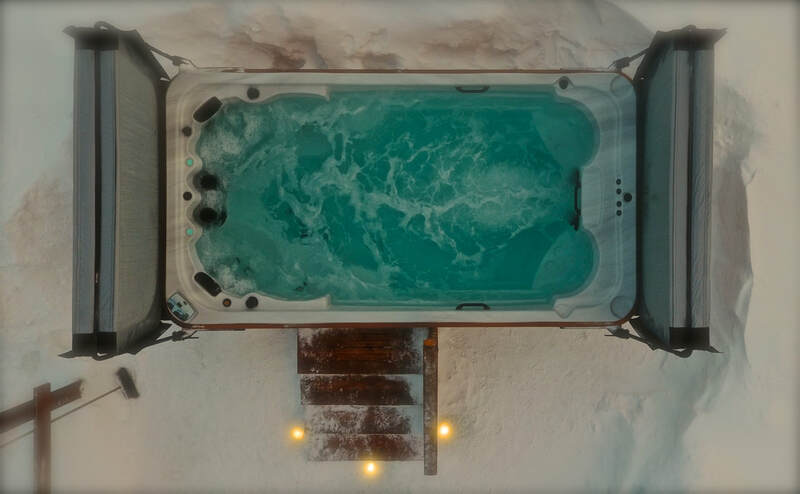 The Arctic Spa can accommodate up to 9 bathers in their own seats. It is also possible to order drinks from the pool by prior agreement. Ylläshumina’s small but amply equipped gift shop is the perfect place to buy souvenirs. 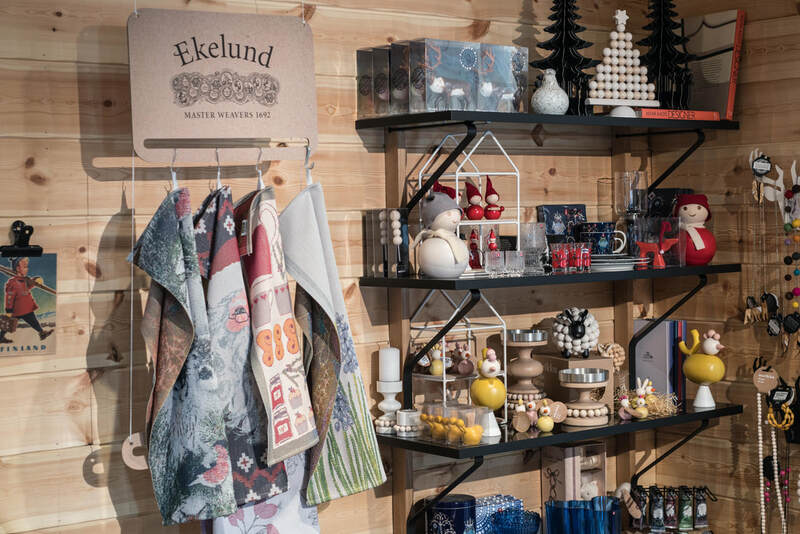 All products are genuine Finnish design articles and include products from famous names such as Aarikka and Iittala. Choose your memento from a range of jewellery, glassware, candles, jumpers and much more. The gift shop is located in the main reception building of Ylläshumina Hotel.